Four pharmacists go the extra mile once again! On April 23rd, 2015 Pharmacist Support Chief Executive, Diane Leicester-Hallam travelled to Leicester to join attendees at the Association of Independent Multiple Pharmacies (AIMp) conference for a special presentation. Following their recent fundraising journey to India our ‘Four pharmacists in a car’ adventurers (and AIMp members) Kirit Patel, Hiten Patel, Peter Cattee and Manvir Patel joined forces once more to make a personal donation to the charity. 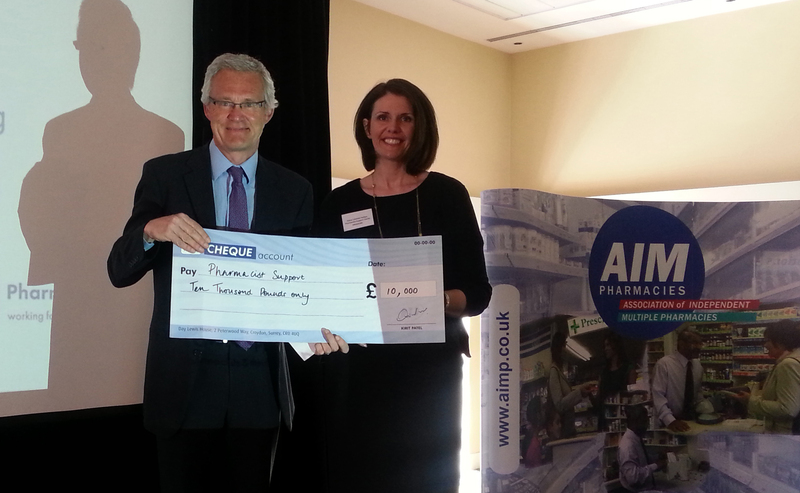 On behalf of his colleagues Peter Cattee (pictured with Diane) presented a cheque for £10,000 to Pharmacist Support to help the charity in its support of the hundreds of pharmacists, trainees and MPharm students who call on its services every year. Peter Cattee added: “We chose Pharmacist Support because we all still owe pharmacy more than it owes us and this is a small way to help re-balance our obligation. Pharmacy is a more stressful occupation than those on the outside of it realise and we’re pleased to be able to help those who have struggled along the way. I would ask anyone reading this to give something of their time or any other resource they might have, if they are able to help this worthy cause – none of us know what tomorrow will bring”. To speak to the charity about undertaking a challenge yourself or with your colleagues, contact Petra van den Houten on 0161 4410317 or email fundraising@pharmacistsupport.org.